Analytics is becoming important part of maintenance, with applications to analyzing part failures, using failure distributions to simulate product life, and determining the root cause of failures. 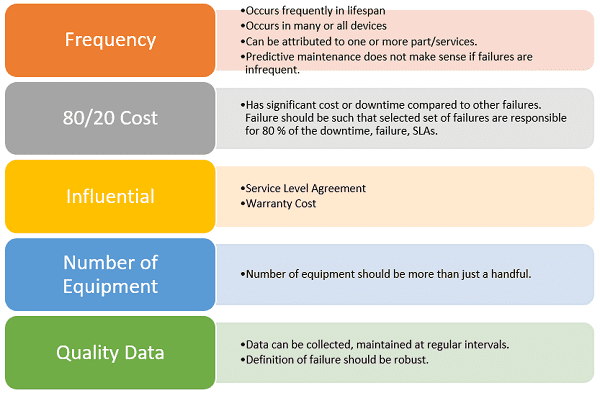 We provide an overview of predictive maintenance, its usage and key issues to be considered. Predictive maintenance might sound like a buzzword but I have seen it in action. I can take the credit to implement it and be useful for end users. Predicting unplanned failures can be beneficial to two user groups. Warranty cost has been a research subject in insurance industry for long. A manufacturer will use predictive maintenance to calculate the right warranty cost and offer to the customer where it provides warranty, extended maintenance and service contracts. Terms and conditions of a warranty and extended warranty are designed based on insights from warranty models. An equipment has many parts. Parts of an equipment go through many inspections, repairs, replacements, and upgrades in its lifetime. Not all parts are costly or fail often. Some parts fail due to wear and tear. Other fails due to external factors. Some failure cause downtime. Others cause sub-optimal performance. A part can be simulated through its failures, inspection, repair schedule. Recording historical data on every part is theoretically feasible but one might find it hard to justify return on investment. An aircraft has more than hundred thousand parts. One can say the same for any heavy equipment. Practitioners generally follow failure mode effect analysis techniques to identify parts and failures. Criterion below can be chosen to decide the failure modes, parts, equipment to focus on. Above mentioned steps are there when you have historical data on events and failures. Many companies still struggle to calculate system uptime, downtime statistics and reliability numbers. 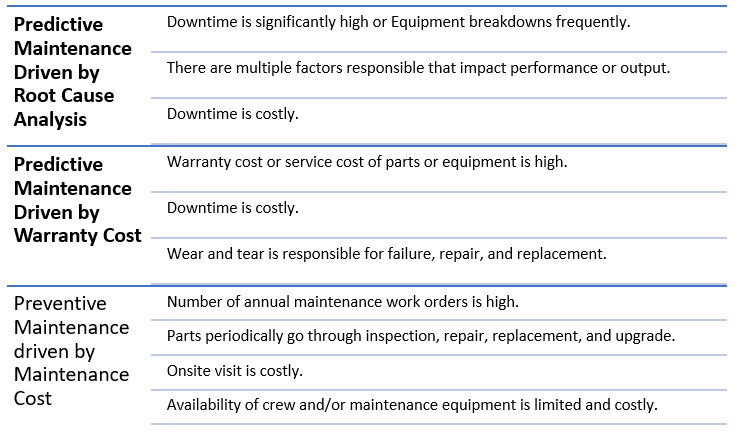 Getting downtime calculations right is an objective that can be accomplished in limited time and resources and will be a good foundation for any type of analytics on maintenance data. Not everyone should do invest in predictive maintenance but investment in downtime calculations will always dividends in short and long term. Question generally asked is: when should one go to invest in predictive maintenance? Your business scenario should fit one of these criterion in case you want to explore predictive maintenance? These approaches and scenarios are not mutually exclusive. Next step is to conduct a feasibility study and determine return on investment in short term and long term. Bio: Vinay Mehendiratta, PhD is the CEO and Founder of OceanFrogs Consulting Private Limited. Vinay uses optimization, simulation, and predictive analytics techniques to solve scheduling, assignment, and predictive maintenance problems.